How do you get the bad taste out of your mouth of a nationally televised 49-point loss to Duke? In the case of UNLV, you take your frustrations out on Incarnate Word. The Runnin’ Rebels (6-4), despite playing without starting forwards Christian Jones and Dwayne Morgan, bounced back from Saturday’s ugly 94-45 loss to the Blue Devils by delivering a 92-64 beatdown of the Cardinals (5-4) on Wednesday night at the Thomas & Mack Center. Incarnate Word, which lost by only five points at Texas in its season opener, made it interesting for a while, trailing only 26-24 with 3:33 left in the first half after a 3-pointer by guard Jorden Kite. But UNLV, behind eight points by guard Jovan Mooring, including a pair of 3-pointers, went on a 12-4 run en route to a 38-30 halftime lead and led by as many as 31 points in the second half. HOW IT HAPPENED: After Cardinals guard Jalin Hart cut UNLV’s lead to single digits, 56-48, with a fast break layup, the Runnin’ Rebels went on a 25-6 run over the next seven minutes to blow the game open with senior forward Tyrell Green leading the way with 10 of his game-high 21 points and a pair of steals. WHO STOOD OUT: Five Rebels scored in double figures led by Green (21 points, 10 rebounds, three steals) and sophomore guard Kris Clyburn (13 points, 12 rebounds, four assists) who both finished with their first career double-doubles. Mooring (17 points, 2-of-3 3-pointers) and freshman forward Troy Baxter Jr. (10 points, eight rebounds) helped UNLV to finish with a huge 37-18 edge in bench points while 6-foot-11 freshman center Cheickna Dembele added 13 points and seven rebounds before fouling out in his first college start. QUOTES TO NOTE: “This was a gut-check game for us. 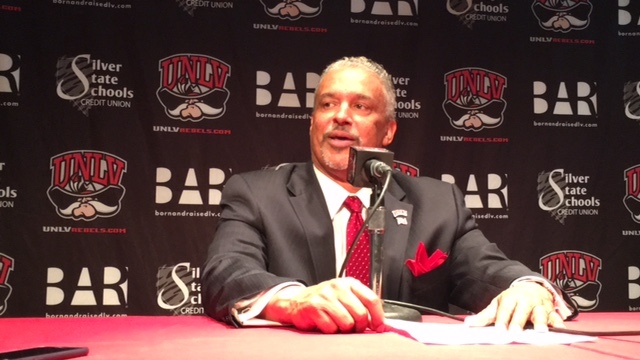 Everyone was focused and ready to go.” – UNLV forward Tyrell Green. “(Duke) was a tough loss. Everybody felt that. Getting a win like this is a big confidence-booster. It helps us carry on to Saturday (against No. 22 Oregon).” – Runnin’ Rebel guard Kris Clyburn. UP NEXT: UNLV hits the road again to face 22nd-ranked Oregon (8-2) at the Moda Center, formerly known as the Rose Garden Arena and home to the Portland Trail Blazers. The 8 p.m. contest will be televised by ESPN2. NOTABLE: Menzies said the chances were “slim” that either Jones (ankle) or Morgan (shoulder, hip) would be ready to play against Oregon. … UNLV shot 47.7 percent from the floor including 9-of-20 from 3-point range. … The Runnin’ Rebels finished with a season-high 52 rebounds, including 17 offensive boards, compared to 33 rebounds for the Cardinals. … The Rebels held Cardinals guard Shawn Johnson, who came into the contest second in the Southland Conference in both scoring (19.3) and rebounding (9.4), to just four points on 1-of-8 shooting and three rebounds. … Incarnate Word shot just 34.8 percent (23-of-66), a season low for a UNLV opponent.